My family and I are originally from Chile and we moved to the United States when I was seven years old in 1997. My passion and love for STEM emerged when we boarded the airplane that would take us to our new life in the United States. Once we boarded the airplane, the flight attendants asked me if I wanted to visit the flight deck and say "hello" to the pilots. This was an offer I could not refuse because the curiosity in me had never been at the front of an airplane before. Once I reached the front of the airplane, I remember the door was wide open, I looked up at the overhead panel in disbelief at how many buttons, and lights there were. The two pilots greeted me warmly and showed me the different things around the flight deck; they even let me try on one of their oxygen masks! From that moment forward I promised myself that I would do everything possible and within my reach to achieve my dream of one day becoming an airline pilot. This was the moment that sparked my interest in aviation. The life of an airline pilot entails a large sense of responsibility. A pilot is responsible for the wellbeing of their customers, their fellow crewmembers, and the overall safe operation of the aircraft. To be a successful airline pilot one must possess a variety of skills such as being able to multi-task, active listening, work well with others, have good situational awareness and always make decisions that would result in a safe outcome. An average day for me as an airline pilot entails waking up three hours prior to departure. I have a checklist printed at home so that I do not forget anything prior to arriving at the airport. Items on my checklist include headsets, batteries, sunglasses, glasses, passport, license, medical, wallet, keys, clothes and many snacks. We are required to arrive at the airport one hour prior to departure. During this time we are greeted by AO's and then led down the jetbridge in where I meet my inflight crewmembers and my captain. During this time, the captain and I decide who will fly first. If you are the person flying first then your responsibility is to set up the interior of the flight deck, if you are not the pilot flying then you are responsible for doing the exterior inspection of the aircraft. Once all customers have boarded the inflight crewmembers close the cockpit, the boarding door and we are ready to go! We then obtain clearance from ground control to taxi and soon after a takeoff clearance from the tower controller. Once we are in the air we are actively monitoring all aircraft systems and communicating with air traffic controllers en route to our destination. Once we land, we secure the aircraft, complete the exterior inspection once more and head to our hotel, next destination or home. ​3. Do you have a female role model who inspires you? Most people for these types of questions would choose someone that is in the history books that inspired them to greatness. Although all of our female aviators are pioneers and deserve all of the merits in the world for their accomplishments, for me, the female role model that inspires me would be my grandmother, Belgica. She was a strong, authentic, and independent woman. My grandmother was raised in a world where women were supposed to stay at home and couldn't speak up for themselves. My grandmother was a fierce woman, who up until this day still inspires me. During the dictatorship era of my country, she was able to successfully become the first women to open a restaurant at the horse racetrack in my country. By doing this, she was able to provide for all three of her kids, including my mother. My grandmother was authentic and was not afraid to speak her mind and correct you when you were wrong. She was a strong woman because she knew that there would be no future for my parents and myself in Chile and advised us that we should move to the United States to seek a better life and job opportunities. I know that this decision to advise my parents of leaving the country would hurt her so much but she was strong enough to see beyond her own needs and put the needs and lives of her loved ones ahead of her own. My grandmother inspired me because she believed in me and knew that I would achieve my goals of becoming a pilot. She encouraged to never give up and she would always tell me, "never, ever take no for an answer, because the moment you do is the moment you give into the norm of what people expect women to be in today's society". These words still resound inside of me as if it were yesterday when I heard them. Although my grandmother was not able to see me become a professional pilot, I know she is still my biggest supporter and fan from wherever she may be. 4. What kind of obstacles have you faced getting to where you are now? During my life, I have had to face many obstacles to get to where I am today. As I have mentioned before, I was born in Chile and leaving my family was extremely difficult for me. We came to the United States without knowing anyone here and not speaking a word of English. I remember walking into my second-grade classroom on a cold and snowy January. The classroom door suddenly opened and I remember holding my mother's hand so tight and she kneeled down and told me to remember the word "bathroom". From there on, I had to overcome the obstacle of learning English and being bullied by other kids because I didn't speak English. By the time I was in third grade I was fluent in English and had no further issues. As with all new immigrant families in the United States, I faced the issue of establishing permanent residency with the US government. My father applied for green card status through his job in August of 2001. The terrorist attacks of September 11 would halt all immigration application and it would take us 17 years to obtain green card status in the United States. We were denied over and over again but as a family we never lost hope. I remember telling one of my close childhood friend, Daisy, that I was so afraid because I will never achieve my dream of becoming a pilot. My fears would soon become a reality because after our third denial for green card status my family and I were put into deportation proceedings. I was in college at the time and I was already flying and working on my Commercial Pilots License. I saw no light at the end of the tunnel. I didn't understand why a hard-working family such a mine who had paid their taxes and served their community was being treated so unjustly. I was working three full-time jobs at the time which included cleaning houses and two cashiers job all while taking 18 college credits and attending flight school. Eventually, this would soon pass when a judge decided that we could stay in the United States. Overcoming these obstacles have allowed me to appreciate what I currently have but also it's a constant reminder for me to never forget where I came from and the struggles I faced along the way. 5. What milestones have you already reached or are you currently moving towards? I have reached many milestones in my professional career in which I take a lot of pride. I am currently the holder of an Air Transport Pilot Certificate with type ratings in Airbus 320, Boeing 737 and Embraer 170/190. Holding this type of certification makes me become a part of the 5% of women in the world that are airline pilots. I have dedicated thousands of hours of community service to improve the lives of inner-city schools kids interested in a Science, Technology, Engineering, Arts, and Math (STEAM)-related field and the lives of her fellow pilots. I am an active volunteer with a variety of organizations such as Women in Aviation (WAI) and the Latino Pilots Association (LPA). My work and mission within these organizations are to mentor the future leaders of the aviation industry. I am also a member of the Air Line Pilots Association serving as a member of the Critical Incident Response Program (CIRP), Professional Standards Committee (PSC), And the Pilot Assitance Network (PANS), which all assist individual pilots. My community service extends well beyond the flight deck, as I am also a spokesperson for organ donation throughout the United States, in where I raise awareness on the importance of giving the gift of life to others. My efforts in my community and volunteerism have been recognized locally but most importantly nationally, as I have been a two-time recipient of the prestigious President's Call to Service Award. This award is given to individuals who have completed over 4,000 hours of community service in their lifetime. This award was presented to me by President George W. Bush and President Barack Obama. I hold a Bachelor's Degree from Vaughn College specializing in Aircraft Operations; I also hold a Master's Degree from Embry Riddle Aeronautical University with specializations in Aircraft Accident Investigation and Human Factors. I am currently defending my dissertation at Walden University, which focuses on Loss of Control in Flight; once I have completed this, I will hold a Doctor of Education Degree specializing in Higher Education and Adult Learning. I am also a college professor teaching a variety of courses, which include Aviation Safety, Human Factors, Crew Resource Management, and others! This year I was made JetBlue's First Female Director of the OBAP ACE Academy in New York City. Throughout the year, preparations for the summer camp are tedious and time-consuming. Myself and my partners Jeffrey Gonzalez (E190 Captain) and Gabriel Mercado (A320 First Officer) visit a number of schools in the New York City area to recruit new students for the summer camp that is held on the second week of July each year. Our mission during these visits is to raise awareness about aviation and inspire the future leaders of tomorrow. On a personal level, one of my greatest accomplishments is to have given birth to a wonderful baby boy named Laurence. 6. If you could go back and tell your younger version of yourself one thing, what would it be? Never take no for an answer. The moment that you do is the moment you stop pursuing greatness. 7. How has JetBlue affected you and the work that you do? Being a JetBlue crewmember has been one of the most rewarding things that could happen in both my professional and personal career. I love coming to work every day and meeting new people. 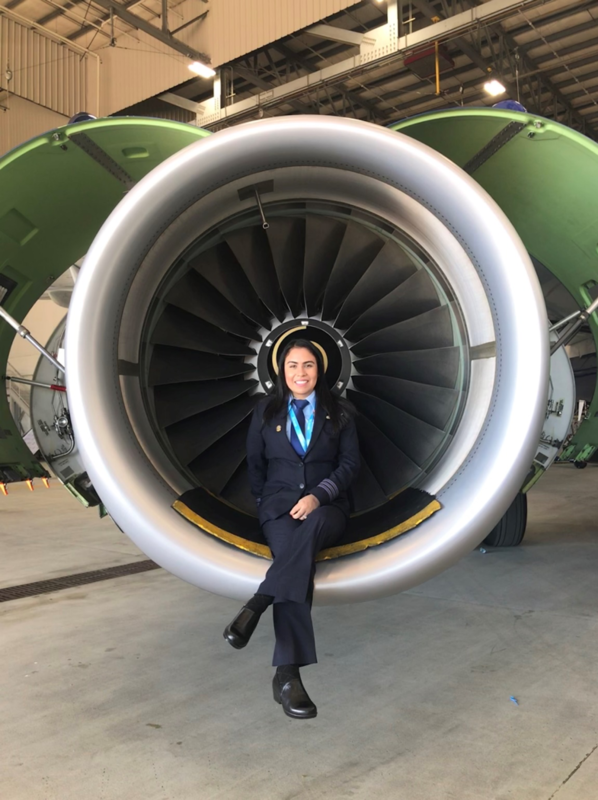 JetBlue has allowed me through various initiatives such as the JetBlue Foundation to achieve my goal of reaching out to young girls and speaking to them about the aviation field. To be a part of the JetBlue family gives me a sense of joy and excitement because I am a part of something bigger than myself and through this organization, I am able to achieve the unimaginable which is to fly an airplane for a living. 8. What advice you do have for someone who wants to be in your role or a STEM career field? I would tell them if a seven-year-old little girl from Chile came to the United States without speaking a word of English accomplished her lifelong dream of becoming a JetBlue Pilot, then there is nothing that can stop you from achieving yours. All you need is a dream, passion, and perseverance to achieve greatness in the STEM field. 9. Why do you think girls/women are underrepresented in aviation and STEM? I believe that women are still underrepresented in the STEM field because there is still a social norm for girls that still being accepted in today's society, which is to expose girls to traditional jobs. The lack of exposure to STEM comes from a lack of awareness from family, friends, advisors, teachers and/or the very same individual. 10. How can we get more girls interested in STEM? Well, we should encourage crewmembers to make it a goal for the year to try and reach out to at least ten girls in the year and speak about careers in aviation. If all pilots, mechanics, inflight crewmembers reach out to at least ten girls and implant the seed that there are careers in aviation that they can pursue then we will have secured the future of aviation. Another method would be to support organizations such as OBAP, Women in Aviation, and the Latino Pilots Association in executing their mission of spreading aviation awareness through scholarship initiatives, aviation camps, and guest speaking events.